There is still no word on Bill White’s condition nor his situation at the Seminole County Jail/John Polk Correctional Centre. At this point in time he is not permitted contact with anyone, no telephone and no mail appears to be going in or coming out. Bill White appears to have gone into complete lockdown pre-trial. But why…what could he say that would possibly be so damaging to either the jail or the upcoming trial? This question is pretty easily answered. Firstly, someone left open a loophole via which I can check up on Bill’s current state. Bill White, as everyone knows, is a prolific writer – well….no stamps or writing material has been purchased, likewise no food….in fact Bill White does not appear to have used his account at all since the 18th of June. Obviously this means he isn’t ‘alright’ or ‘safe’ in there. The inactivity of his account suggests that he is actually in a critical condition and very ill. The fact that Seminole County Jail/John Polk Correctional Centre refuses to let anyone speak to him or even divulge any information about the situation suggests that there are trying to hide something, something serious which is likely to create some serious waves. At this point, I’m beginning to doubt if Bill is even conscious most of the time. Secondly: Bill White needs to be healthy by the start of September or the US Attorney’s whole case is sunk. No one is going to believe a terminally ill man with no followers and hardly any friends successfully extorted legal professionals and FBI agents with five ridiculous sounding emails. So Seminole County Jail has botched everything up on that front too. The worst thing that can happen is for allegations of torture and Human Rights Violations to start appearing just a few weeks before a trial. The only thing that would be worse for the Seminole County Jail’s reputation (which has been bad since 1975 when a whole bunch of people burned to death there) is if the US Attorney decides to blame them for the huge pre-trial foul up – and frankly I would if I were him. As to how I know Bill White is not in a good condition, some people would say its magic; others would say that I’m just really good at noticing the bits of dirt people forget to sweep under the carpet before the inspector comes around. Seminole County Jail left a trial of breadcrumbs for me to follow. 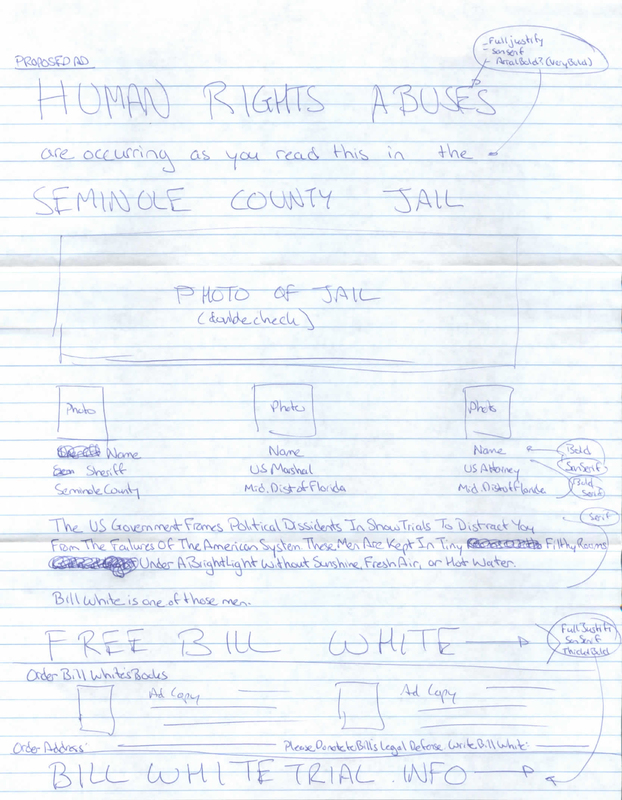 I currently believe that Bill White is not fine, not safe, and not in any way being treated properly by the Seminole County Jail/John Polk Correctional Centre. They are also trashing the US Attorney’s case by proving to everyone that all the past statements he made about being tortured in prison are true. Do not telephone the Seminole County Jail/John Polk Correctional Centre or attempt to negotiate with them. Instead they must be over ruled by international law. Send your complaints directly to the United Nations Representative and invoke Human Rights charter and conventions against the torture of prisoners. When the law is broken, only an appeal to a higher authority can remedy the situation.